Raptor Resource Project Blog: Where Did That Falcon Come From? Where Did That Falcon Come From? Yesterday, facebook user Jeff Suggs asked if any of the falcons we watch have Australian roots. The short answer is 'No'. As far as we know, none of the falcons we watch can trace their ancestry back to falcons imported from Australia for North American captive breeding and release programs. Having said that, the Peregrine Fund did include Australian Falcons (Falco peregrinus macropus) in the breeding stock they used to produce falcons for release. "Breeding projects were stocked with birds from many locations. The CWS Wainwright facility had birds taken from the wild as nestlings from northern and southern Alberta, the Yukon, and the Northwest Territories, Canada; the McGill facility had birds from northern Quebec. The Peregrine Fund at Cornell University had birds taken as nestlings from Alaska, Scotland, Australia and other places, while the Fort Collins facility had mainly birds from the Rocky Mountain region. Most of the birds at the SCPBRG were from California." From what I was able to find, most of those falcons were released in the eastern United States. The use of non-native stock was quite controversial, as chronicled in the wonderful book Peregrine Falcon: Stories of the Blue Meanie by Jim Enderson. So how do we find out where birds come from? I like to use the online Midwest Peregrine Falcon Database, which is maintained by the Midwest Peregrine Society and the Raptor Center at the University of Minnesota. Take 11/X, the immature female at Great River Energy. 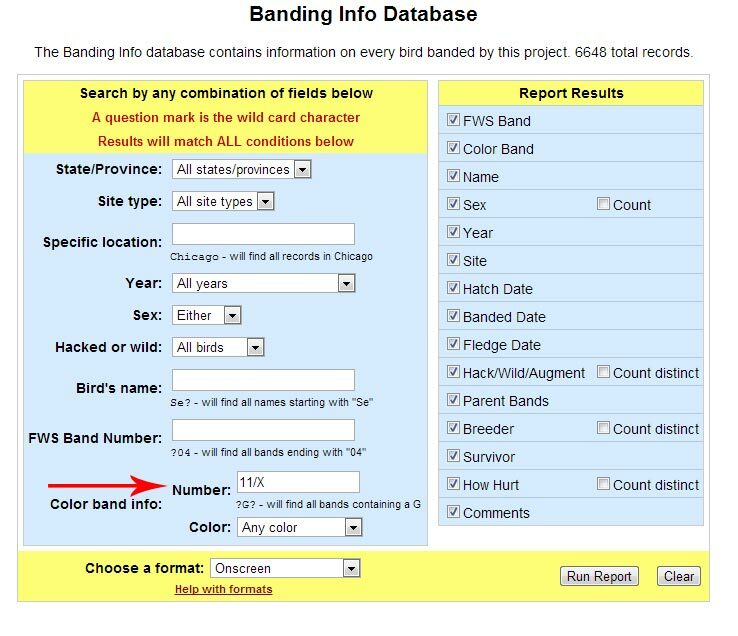 To look up her band number, follow the link below and enter 11/X in the number field of the color band info category. If you have a band color, select it from the dropdown to narrow your search. Most of our birds are either black over green or black over red. It turns out that 11/X is MaryEllen, a 2012 hatch from Queen's Bluff in Winona County, Minnesota. Since both of her parents are known, I can trace her ancestry through them. MaryEllen's mother has FWS band number 1807-77654. By entering that number into the FWS field, I learn that her name was Jean. Jean was produced at Maiden Rock in 2001, the first year there were birds on that cliff, and banded by Bob.Jean's mother was the unnamed 1807-61966, who was produced at Firstar Bank in Cedar Rapids, Iowa, in 1999. Her mother 1807-29469 was captively produced by breeder and falconer Pete Widener and hacked from Des Moines Iowa in 1991. Now for the Dads. MaryEllen's father was Cranberry 816-38602, produced at the Dairyland Power Alma plant in 2004. Bob also banded this bird. I remember it well, since we had to rush up the stack in between thunderstorms to get the young falcons. His father 2206-62744 was produced at Firstar Bank in Cedar Rapids, Iowa in 2000. His father 2206-13875 was produced by breeder and falconer Bruce Haak, a friend of Bob's, and also hacked from Des Moines, Iowa, in 1991. MaryEllen's parents are related through grandfather 2206-13875, who was present at Cedar Rapids in 1999 and 2000. Thanks to bands and bird banders, the North American peregrine falcon is probably the most-documented bird population in the world. As I said in another post, if you see a band number, please post it here or on our forum. We love to know who we are watching! Jean's mate Gunnar was a bird produced and released by the Raptor Resource Project at Effigy Mounds in 1999. We'll be writing more about that project later this year.